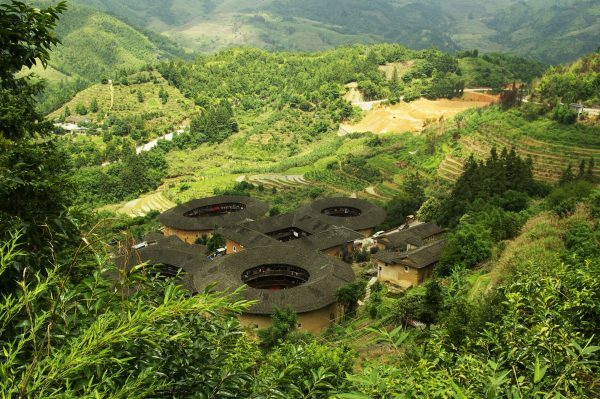 The Fujian Tulou or Fujian Earthen Structure is a type of dwelling built by the Hakka and Hoklo people in the mountainous regions of southern Fujian. 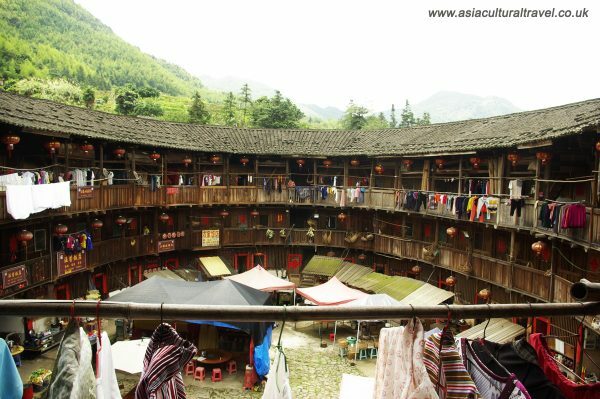 A Tulou is a large, enclosed structure that is usually circular or rectangular in shape and is used to house multiple families. They are usually between 2 to 5 storeys high and the largest Tulou can hold up to a hundred families. Every family in the Tulou community enjoys perfect equality because every room in a Tulou is the same size and has exactly the same design. These large clay buildings are usually two to five storeys high and have a specific, defensive function. There are no windows on the external walls of the ground and first floors, while there are small windows on the walls of the second floor and above. The base of the wall is about 3 meters thick. The wall of the first floor is 1.5 meters thick, so the wall reduces in thickness slightly as it ascends. From the beginning of the Western Jin Dynasty (307-12 BCE) onwards, there were several significant immigrations from central China to Fujian. Among these immigrations, there was a particularly large scale one that took place during the late Tang Dynasty (7th-8th centuries). It was those immigrants that settled down in the southeast of Fujian Province and subsequently became the Hoklo people. During the Song Dynasty, due to the conquest of northern China by the Jin ethnic group, many people fled from central China yet again, bringing with them their culture and language. These people finally settled down in Fujian, Guangdong and Jiangxi and formed the Hakka ethnic group. 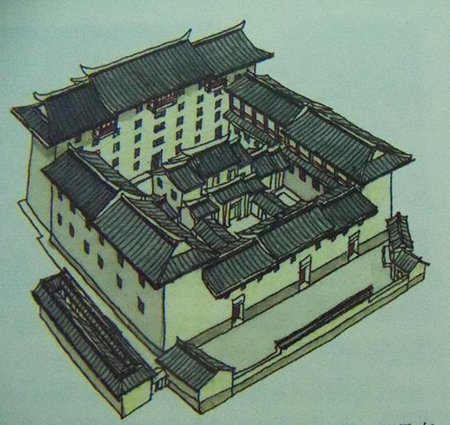 In the beginning, the newcomers built houses following the traditional Han-style of architecture. However, during the Ming (1368-1644) and Qing (1644-1911) dynasties, society was unstable because of frequent fighting between ethnic groups, and all the while robbers and thieves were running rampant. The Hakka and Hoklo people improved their homes gradually so that they eventually became a perfect defense against attackers and trespassers. These fortress-like dwellings were called Tulou. The first Tulou appeared at some point between the 11th century and the13th century. The design for the Tulou was developed from the 14th century right through to the 16th century, and reached its peak between the late Ming Dynasty and the late Qing Dynasty (17th – 18th centuries). 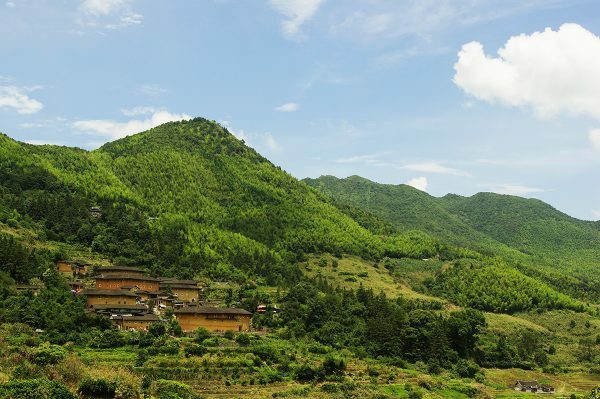 According to national records, there are more than 1,100 circular Tulou in Fujian. 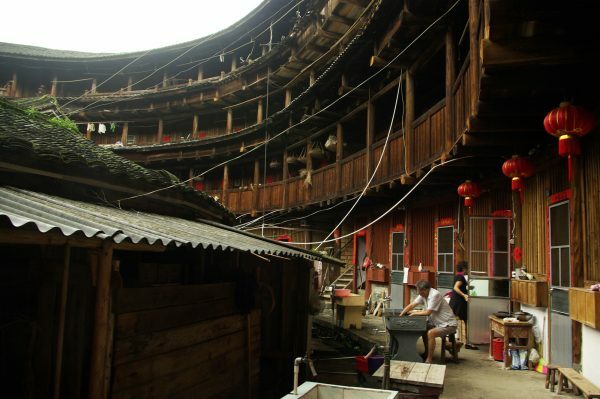 Among these circular Tulou, nearly 800 of them adopt the “connected rooms” design, where each room on the same floor is connected by a corridor, and more than 300 of them are composed of separated rooms, in which each family has their own “apartment”. 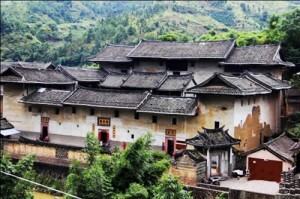 Generally speaking, the Tulou inhabited by the Hakka people mostly follow the “connected rooms” design, while the Hoklo people prefer Tulou that have separated apartments. Each floor in the Tulou has a specific function and follows the same general design rules, regardless of whether the Tulou has “connected” or “separated” rooms. The kitchens and living rooms are always on the ground floor, the first floor is for food storage, and the second and third floor rooms are used as bedrooms. In some Tulou the food is stored on the top floor to keep cereals dry, but this can be somewhat inconvenient when cooking as the kitchens will still be on the ground floor. Most Tulou have an Ancestral Hall in the middle of the yard for inhabitants to worship their ancestors. Around the Ancestral Hall there are usually rooms that used for studying. 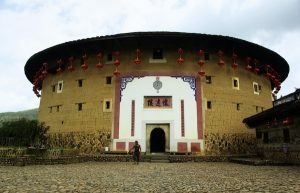 Longjian Lou is a typical example of a Tulou that follows the “separated rooms” design. It has more than 300 years of history behind it. The diameter of the whole site is 82 meters. It is the biggest of all the existing and well-preserved circular Tulou. Longjian Lou is made up of three rings. 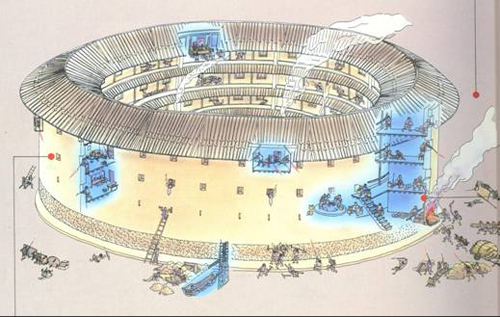 The external ring makes up the main structure and has three floors, with 50 rooms on each floor. By comparison, the two internal rings are only one-storey high and their rooms are used as kitchens and living rooms. 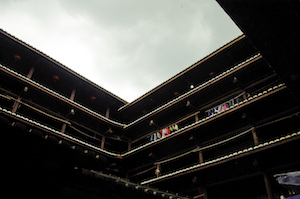 There are more than 2,100 Tulou that have a rectangular shape. 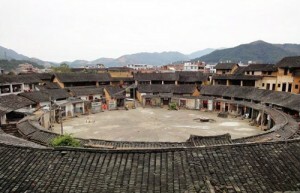 Among these rectangular Tulou, more than 1,900 of them follow the “connected rooms” design and about 200 of them follow the “separated rooms” design. 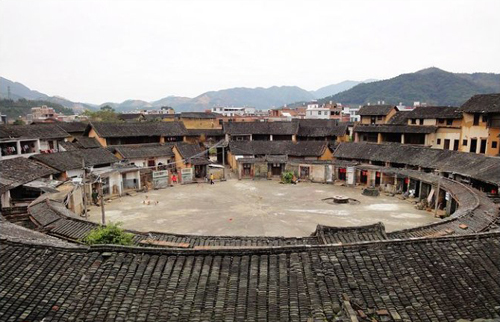 Some rectangular Tulou have a large yard in which small courtyards can be constructed. Most of these small courtyards were built to house Ancestral Halls. Some rectangular Tulou have more than one yard, and these extra yards have been made by adding annexes onto the periphery of the individual apartments. Nowadays there are only 30 people living in this Tulou. Xishuang Lou is a huge Tulou compound. It covers 94m*86m filed. The main Tulou in this group is a three-storey rectangular Tulou that follows the “separated rooms” design and is divided into 65 “apartments”. In the large inner yard there are six small courtyard houses that make up the Ancestral Hall. This monumental compound was constructed in 1679. There are still more than 500 residents currently living there. In Chinese, Wufeng refers to five mythical birds, each of a different colour, and it also stands for the four points of the compass – north, south, east, and west, and the centre (making five points altogether). 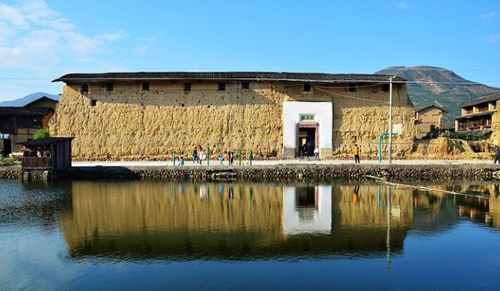 The name Wufeng Tulou signifies that the compound has buildings that have been specially placed in all five of these positions. A Wufeng Tulou is multi-layered and thus, from an exterior perspective, it resembles a grand palace and also a phoenix that is about to take off into the sky. 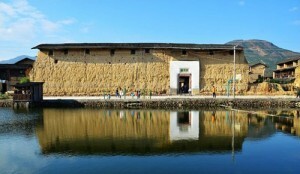 A typical Wufeng Tulou consists of three main buildings that sit along its central axis. The shortest building, the one at the base of the axis, forms the entrance. Further along there is the central building. The central building is taller than the entrance building and usually serves as the Ancestral Hall, which is at the centre of the entire compound and is used for holding clan ceremonies and receiving guests. Finally, at the top of the axis, there is the rear building. The rear building is between three to five storeys high and is the tallest of all the buildings. 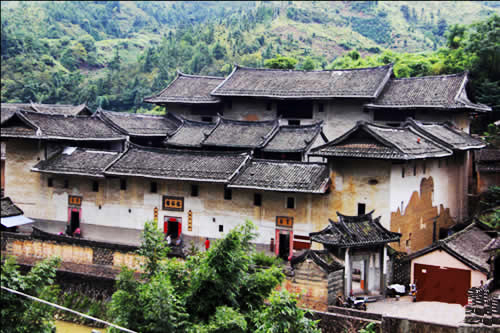 It forms the main structure of the Tulou and its rooms function as bedrooms for elder members of the family. These three buildings are connected by corridors that form two yards. Rooms on each side of the yards are used as kitchens, studying rooms and toilets. 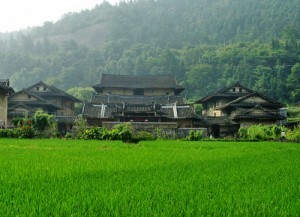 Wufeng Tulou are the earliest form of earthen houses. This is why their style most closely resembles that of traditional Han-style architecture from the central plains of China. Their appearance and design gradually evolved into that of the rectangular Tulou and the circular Tulou over time. 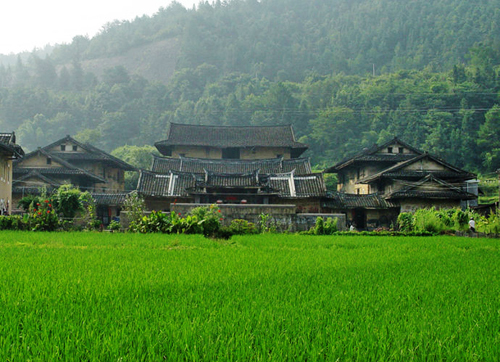 The only feature that still connects the more modern Tulou to Han-style architecture is the position of the Ancestral hall within the inner yard, which follows the traditional Confucian principles in Han culture. There are about 250 Wufeng lou in Fujian Province. Since they were the earliest dwellings built by immigrants from Central China, Wufeng Tulou were built according to traditional Han ethnic principles and the layout followed Fengshui theory1, which they believed would bless the family with scholarly honour and high ranking official positions. In Chinese, the meaning of “Dafudi” is “the residence of a government official”. 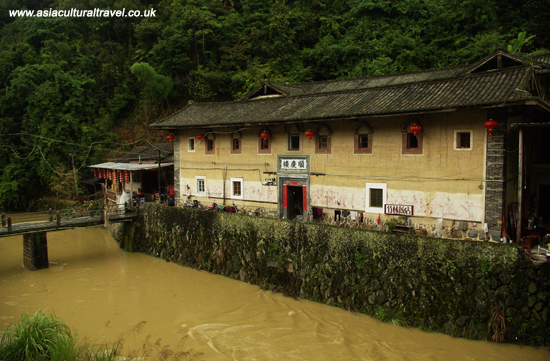 Dafudi was built in 1828 and is the best example of a Wufeng Tulou. Fuyu Lou is a large Wufeng Tulou with six inner yards. Built in 1882 by three brothers, it follows the Han-style of architecture intricately and beautifully. The ground and walls have been paved or built with cobblestones, to make the compound look more luxurious than others. The exterior shape of the building makes it look like three mountains, which suggests that the three brothers who built it were like three magnificent mountains.